Michael Levy, PhD, assistant professor of Biostatistics and Epidemiology, at the Perelman School of Medicine, University of Pennsylvania, along with other collaborators from Penn, Johns Hopkins University, the Centers for Disease Control and Prevention, and Universidad Peruana Cayetano Heredia in Peru, are in the trenches combining tried-and-true epidemiological approaches with new statistical methods to learn more about the course of a dangerous, contagious disease epidemic. Their research was published last week in PLoS Computational Biology. Chagas disease, primarily seen in South America, Central America, and Mexico, is the most deadly parasitic disease in the Americas. Caused by the protozoan parasite, Trypanosoma cruzi, it is spread chiefly via several species of blood-sucking triatomine insects. After an initial acute phase, the disease continues to lurk in the body and can eventually cause a variety of chronic life-threatening problems, particularly in the heart. Although there are some drugs to treat Chagas disease, they become less effective the longer a person is infected. The lack of a vaccine also means that the only effective way to control the disease is to control the disease vectors. Because the chronic effects of Chagas disease can take decades to manifest themselves, tracking the development and progression of epidemics has been a challenging problem. In the past, Chagas disease was known mostly in rural regions, but has been spreading into more urbanized areas over the last 40 years. Levy's team has been focusing on one of those areas in the city of Arequipa, Peru. The researchers used epicenter regression, which takes a statistical "snapshot" of disease infection in a particular population to track the history of how an infection takes hold and spreads. Epicenter regression considers the duration of an individual's exposure to infection as a function of distance from their home to an unknown site, or sites, where disease has been introduced, and combines that measure with other known risks to estimate the probability of infection. From this data, the course of infection can be traced backward to infer where and when a disease first struck a community. According to their findings, the Chagas parasite was introduced into the region about twenty years ago, and most infections occurred over the last ten years. 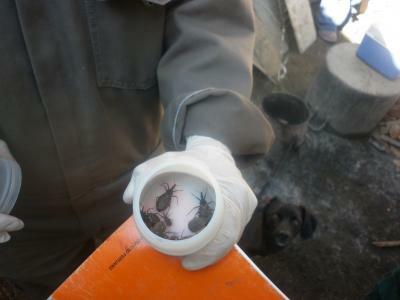 Spread of the disease is being disrupted in Arequipa through insecticide application, but up to 5 percent of the population was infected before their houses were sprayed with insecticide. Levy and his colleagues conclude that the lack of chronic disease symptoms among these infected individuals could be due to the relatively short time of transmission: Most individuals may have yet to pass from the long asymptomatic period to symptomatic Chagas disease. Levy and his collaborators, including Eleazar Cordova-Benzaquen and Cesar Naquira in Peru, plan to expand their epicenter regression modeling techniques to study other infectious diseases, including the West Nile virus in New York City. The method can even be applied to fighting the spread of pesky insects such as bedbugs. "We're trying to work in parallel to improve control of Chagas vectors and bedbugs," he noted. "The idea is if you find a house with bedbugs, where do you go next? Same thing with the Chagas bugs. When they come back after the insecticide campaigns, you get a report and you have to figure out how to react to those reports, which are pretty scattered." Levy and his team have found a way to find patterns, and thus more predictability, in the chaos of infectious disease transmission.